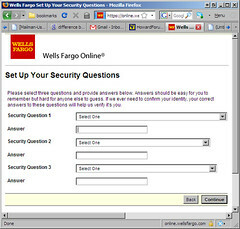 I thought these “easy to remember for you, hard to remember for others” security questions from Wells Fargo are typical of the lifestyle and priorities of people who lived in the U.S. I can think of answers on the bolded ones. But “favorite city other than where you live now”? Wow, I think I heard that topic come up hundreds of times among my college friends. Why would that matter? And are you sure you know your city well enough (is your city that small?) to rate it against hundreds of other cities in the country?